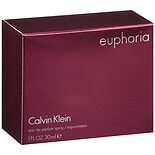 Shop Calvin Klein Euphoria Men Eau de Toilette Spray (1.7 oz. )1.7 oz. If you're looking for a gift that will become a treasured addition to a fragrance collection, try a Euphoria fragrance by Calvin Klein. Whether or not this Calvin Klein fragrance is already a favorite of your friend or family member, it can make a great gift for a man or woman. You can choose between Euphoria fragrance for men and women in eau de toilette and eau de parfum forms here at Walgreens.com. The top notes of a fragrance are the scents that you can notice right away. Mid and base notes last throughout wear. Euphoria for women features fresh and sweet top notes of lush green, persimmon and pomegranate. Black orchid and lotus blossom are among the mid and base notes. Crisp and masculine scents of raindrop and ginger pepper comprise the top notes of Euphoria for men. Both men's and women's fragrances are available in eau de parfum and eau de toilette spray. Looking for other gift ideas or items for yourself? Browse our wider selection of Calvin Klein fragrances. You can find various sizes and types of fragrance, including gift sets that contain lotions and sprays. We carry popular fragrances such as Calvin Klein Obsession, Eternity and Escape in both men's and women's varieties.